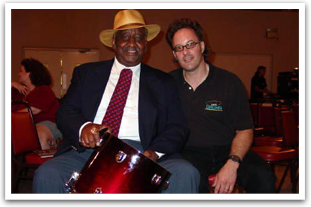 Bernard Purdie has been called “The World’s Most Recorded Drummer”, having recorded with the likes of Aretha Franklin, James Brown, B.B. King, Hall & Oates, Steely Dan, and many others. The 65 year-old native of Elkton, Maryland has laid down the beat on over 3000 albums to date, and the list goes on. 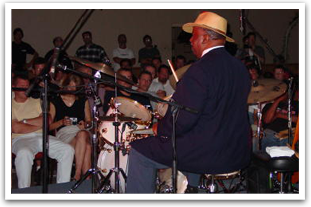 Colleagues describe the drummer’s style as the “funkiest soul beat” in the business, and Purdie has decidedly never limited his talents to the realm of jazz but rather has consistently sought out new musical experiences beyond it’s borders. He has proven that – with all his attention to precision playing – terms such as “DRIVE” and “GROOVE” are definitely not missing from his vocabulary, and those in attendance for this clinic would easily attest to this fact.